The evolutionary jump from prokaryotic to eukaryotic cells has eluded scientists searching for evidence of intermediate single-celled life. Discovery of Lokiarchaeota, the closest known prokaryotic relative of eukaryotes, confirms that eukaryotes evolved from Archaea. “Prokaryotic,” from the Greek pro- (before) and karyon (a nut or kernel), refers to cells that lack a nucleus for housing genetic material. Archaea are prokaryotes equipped to thrive in the harshest environments, like volcanic hot springs or the ocean deep. Eukaryotes (eu- = “well”), on the other hand, have nuclei and other membrane-bound organelles that support the diversity of complex life, from amoebas and fungi to redwoods, to humans. Genealogists around the world were jealous-green at yesterday's announcement that a single-celled organism living 2.5 kilometers under the ocean off the coast of Norway represents a long-sought relative of all cells with a nucleus -- the eukaryotes. This distant relative, formally Lokiarcheota, barely reproduces and scrounges leftovers after the microbes above it have eaten their fill. Forgive the cliché, but Loki is a game changer. For many years, biologists have tried to trace the first nucleus-bearing cells to the simpler cells that came before -- but with little or no evidence either way, the result was mainly academic discord. Now we know: Genetics prove that Loki, although not yet sophisticated enough to have a nucleus, had the same ancestor as eukaryotes -- as us. That's a big deal, as Loki is a member of the ancient microbial domain Archaea. Many have thought that eukaryotes descended from Bacteria -- the other giant domain of nucleus-free microbes. Meet your cousin: Resident of deep, cold ocean mud joins the family! We complimented corresponding author Thijs Ettema, an associate professor of cell and molecular biology at Uppsala University in Sweden, on discovering our ancestor, but he clarified that it's not an ancestor: "This is the cousin of the eukaryotes, from 2 billion years ago, give or take half a billion years." We remained impressed: Here was an Archaea that, like all Archaea, lacked genes for a nucleus, yet it has genes for complex structures that were until now considered unique to eukaryotes. Lokiarcheota is named for its source in the North Atlantic, in a 2,500-meter trough near Loki’s Castle, an undersea mountain. The new Archaea carries mythical undertones of the shape-shifting Norse god Loki, suitable to an organism that blurs the line between prokaryote and eukaryote. Although little is known about how Loki made a living (only its genes are known), this distant ancestor does not live large. "Microbes that live on the ocean floor thrive on anything that might fall down," Ettema told us. "Since Loki was a meter deep in the sediment, all these microbes above it are able get to those nutrients first. It was eating whatever was left." Living near 0°C, Loki may divide only once in a decade. 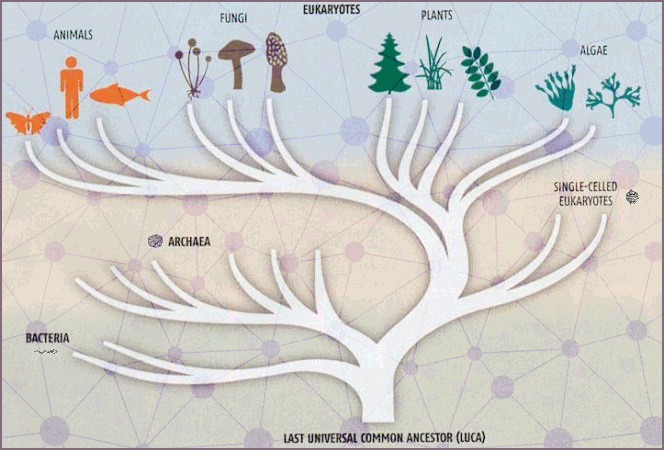 Having identified a new organism that we share an ancestor with, Ettema cautions that "We are looking at a modern-day organism that is not identical to our common ancestor." Two billion years ago, "Earth was a completely different world, there would not have been a lot of oxygen in the atmosphere or ocean; it was not an environment that was very friendly to modern organisms." 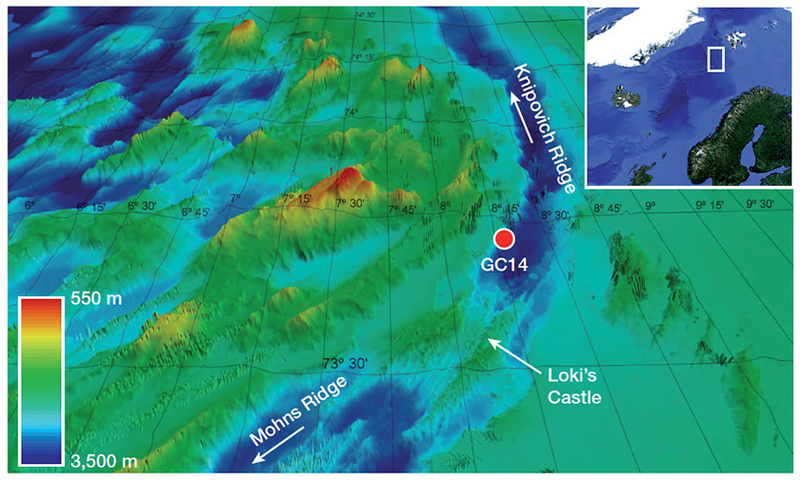 "Loki was chilling out in the ocean floor sediments, in an environment where there was not a lot to eat." DNA is isolated and cut into short strands. Using high-speed sequencing, the letters in each strand are read (for example, TATTTACGCGATTC TGAGAGTTC) and CTTGACATTATTTACGCGATTC). Organisms are identified through a variable stretch of RNA called 16S, which "is a marker used worldwide to answer the question, ‘Who is there?’" says Ettema. "It's a sort of barcode." High-intensity sequencing and computing produced a microbe with an ancient relationship to all higher organisms. Like us, Loki descended from an ancient bridge between prokaryotic and eukaryotic life that lived about 2 billion years ago. Loki’s genetic material resembles eukaryotic genes, but the organism has no nucleus, so this deep-sea critter grew from a microbe that connects simple and complex cells. Loki was an Archaea, but it carried many genetic signatures of eukaryotes. "We identified about 100 genes that Loki uniquely shares with eukaryotes, that were considered unique to them," Ettema says. take up objects -- even organisms -- from the environment. This could have allowed eukaryotes to consume the microbes that became mitochondria -- internal energy machines. And thus Loki is part of the long lineage of eukaryotes -- people, plants, fungi and the rest -- and all of that descended from Archaea. "We have known very little about the timing of the events surrounding the development of eukaryotes," Ettema says. "Now we know that some amount of cell complexity occurred before the nucleus or the organelles came into play. There was already a toolkit."